Welcome to the 20th episode of the DFB Podcast! About a year ago, we wrote about first-day traditions at Walt Disney World. We had so much fun reading your responses about what YOU love to do on your first Disney day that we wanted to dedicate an ENTIRE podcast to the subject! So think about it: What’s your first-day Disney tradition? 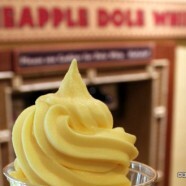 In this episode we cover the latest Disney Food News. Then, AJ and Brad share their first-day traditions at both Walt Disney World and Disneyland; answer some listener questions, and finally, unveil a new trivia question and reveal the answer to the Episode 19 trivia question! Jenny Y.: I’m going to Disney World for the first time with my “I’m 39 again” parents. Do you have any good ideas for meals for them? Maybe a romantic meal for them to go to alone? Meeter J.: You talk a lot about restaurants in the resorts, but what are your favorite restaurants in the parks? This podcast’s trivia question: Name two restaurants in Disney World that currently have volcanoes as part of their themeing. Send your answer to trivia@disneyfoodblog.com with “trivia” in the subject line to be entered to win a Disney Food Blog Dining Guide e-Book of your choice! We love to eat ribs at Flame Tree Barbecue our first day in the World! Once we rushed from the airport to the hotel and then straight to Flame Tree and barely made it before they closed. Now it has become a tradition. Those ribs are sooooo good. Our first day tradition is going on Pirates, and then having a Citrus Swirl! I know that I am very late in listening to this podcast but it is awesome!!!! I should mention that the restaurant in DCA where you can get clam chowder in a bread bowl is called Boudin’s and pronounced Beau-deans. Just FYI. Keep up the great job! I love listening and reading everything even though I’ve only dreamt about going to WDW. excellent blog! I suppose for now i’ll settle ffor book-marking annd adding your RSS feed to my Google account.